Earlier this year I was introduced to an online literary journal, Critical Flame, that was putting out an all-Adrienne Rich issue. 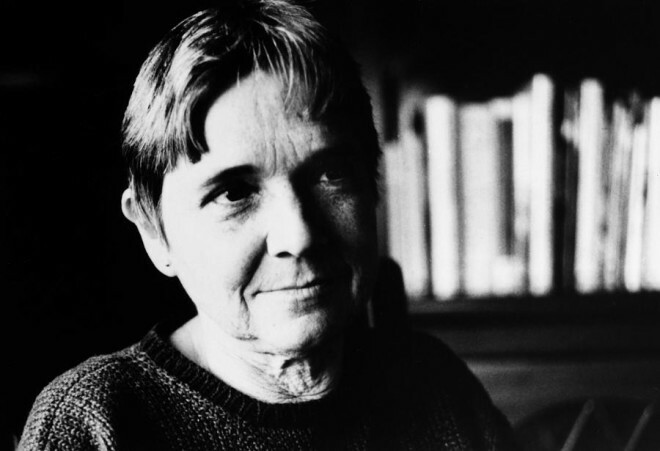 After years of moving and reboxing my Adrienne Rich collection around, in 2012 her passing got me thinking and writing about her again more seriously. I wrote an appreciation of her work and how it had, in fact, changed my life as a young person trying to engage with poetry, questions of “otherness” in literature, and ethics. When this new opportunity to write about Rich came around, I initially had something like this anecdotal, “me and Adrienne” sort of piece in mind. But in fact I ended up writing my way into something much deeper and more challenging, for which I am grateful. Ever since last August I have been grappling with the current wave of state violence against black Americans. In my own narrowly-constrained world–literally on my path from home to the T station each day–I saw in a stalled-out teardown home a metaphor for how routine and the power of social forces make it normal to not take a stand in the face of such violence as the murders of Mike Brown and Eric Garner. So I wrote about that daily question as it worried in my brain and emerged as a winter-gray moth of a poem. was never there. I say I am there. I was struck by the counter-factual power of this “I,” which recalled for me the hashtags by which people affiliate themselves with current protest movements: i.e. “#IAmMikeBrown” (or, for the work of another essay, “#IAmCharlie” or “#JeSuisJuif”). This act of witnessing was basically my starting point, from which I tried to learn as much as I could about the politics and arts of the #BlackLivesMatter movement while also re-immersing myself in Rich. For a couple of months I was returned to the passion and panic of my dissertation days, as I rejoiced at finding some new possibly useful connection among Rich and these other poets and activists, while also bemoaning my own inadequacy and, perhaps, illegitimacy as an interpreter of Rich, Rankine, or the founders of Black Lives Matter. My essay that ended up being published this week is I think a decent first take at this challenging subject, but hopefully just the first step towards further knowledge and action. There is no resolution to these self-excoriations as a writer…there is just publishing something, and then either remaining silent or keeping on trying to learn and write. 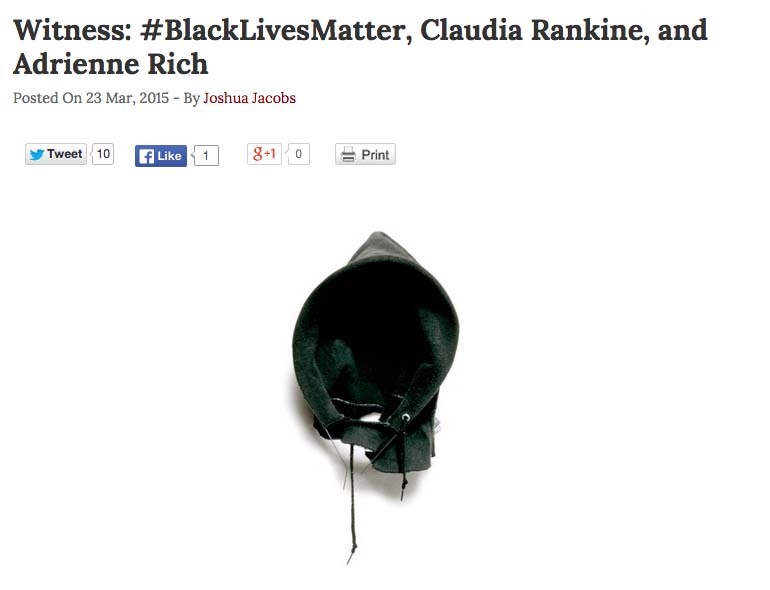 I am grateful to have had the chance to write about Rich in connection with Claudia Rankine’s magisterial book-length poem Citizen: An American Lyric, which offers fascinating parallels with Rich’s work that I have just barely begun to address in my essay. And by chance, Rankine’s poem was released at the same time as she co-edited a collection called The Racial Imaginary: Writers on Race in the Life of the Mind. This collection focuses precisely on some of the questions of claiming subjecthood and perspective on American life, asserting that both the writer’s imagination and mundane life are equally “earthbound” in their inextricable ties to race and racism. Rankine’s co-editor for this book is a Rutgers grad school classmate of mine, Beth Loffreda, whose own contributions to the collection speak eloquently to the necessary challenges that white writers should consider when imagining their own versions of American life. Last week I got the chance to hear Deray McKesson and Johnetta Elzie, two leading activists in the Ferguson protests. Their perspectives that I get via Twitter (like their newsletter) offer a necessary counterweight to the normal version of reality that we get from authority figures, media sources, and even (as they pointed out) “mainstream” protest figures. In my mind I associate their tweets/newsletter with the leaflets, broadsides, and chapbooks that Rich often used to distribute her political essays and poetry throughout her career. What is amazing is how social media enables motivated and brave regular folks like Elzie and McKesson to have a huge impact outside the establishment. Even people who live mostly within the establishment like me have the chance to connect with their insights on a live basis. This is something new and highly motivating for me as I try to reconnect with my writing self and keep moving.